With an aging building stock, and owners reacting to increasing energy costs, Retro-commissioning (RCx) or Existing Building Commissioning has come into being as a stand-alone engineering service. RCx is a systematic, documented process that identifies low-cost operational and maintenance improvements in existing buildings. RCx optimizes existing system performance, rather than relying on major equipment replacement. The objective is to obtain improved indoor air quality, comfort, better control performance, and energy and resource efficiency. 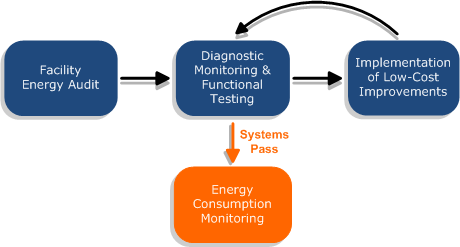 Finn Projects' RCx process starts with our complete energy audit. We then conduct diagnostic monitoring and functional tests of all building systems, focusing on mechanical equipment, lighting and related controls. We implement low-cost improvements to the systems, then re-test and re-monitor to fine-tune improvements. This process helps identify operational as well as technical problems. Finally, once all systems are operating correctly, energy consumption is closely monitored to ensure that the expected energy and cost savings are achieved.